Image credit: Michael Raynor, The Three Rules. And 3. There are no other rules. 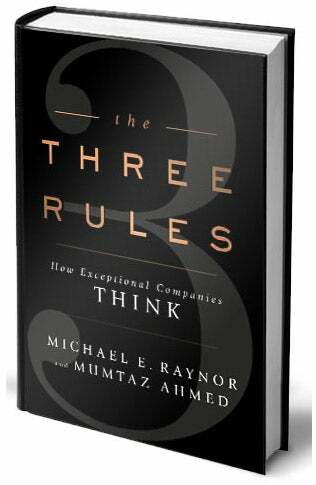 That's according to a recently released book co-authored by Deloitte director Michael Raynor and strategist Mumtaz Ahmed, The Three Rules: How Exceptional Companies Think (Portfolio/Penguin, 2013). Raynor, who earned his doctorate from the Harvard Business School, and Ahmed, along with a team of researchers, analyzed a database of 25,000 companies across hundreds of industries spanning 45 years to identify those companies that were statistically "exceptional." Defining "exceptional" was a project in and of itself, but it began with one question: "How much of a difference is enough to make a difference?" What Raynor's team ended up doing was generating something of an actuarial table for business success. "If somebody says I am 82 years old. Is that person old or not? Well, if they live in the Northern Islands of Japan, that is early middle age because those people live forever. If they are from Tanzania, they are probably the oldest person in the country. What counts as old is a consequence of your context." Raynor and his team also developed a mathematical algorithm that corrected for age of business, date, amount of debt, size and industry, among other variables. The goal of the analysis was to strip out the effects of luck and variation to come to an answer to the question: "What do managers do to make companies great?" says Raynor, who is based in Mississauga in Ontario, Canada. After identifying 344 top performers, Raynor and his team, who officially started working on the project in 2007, looked for common traits to define how those exceptional businesses acted. The team largely came up empty. However, when Raynor and his team started to look at how those exceptional companies think, the principles started to become clear. 1. Better before cheaper. Differentiate yourself from your competition based on quality, not price. While you may achieve some level of success undercutting your competition with cheaper prices, you will almost never become exceptional on a price-based model. 2. Revenue before cost. It will be more valuable to your company to drive your revenues higher than it will be to drive your costs lower. Cutting costs may result in some degree of success, but, most likely, your company won't sustain an exceptional level of greatness. 3. There are no other rules. Technology, talent, markets, people -- it can all change. But don't mess with Rule 1 or Rule 2. Exceptional companies include long-haul trucking company Heartland Express and teen clothing retailer Abercrombie & Fitch. The companies are all publicly traded companies, larger than the sorts of companies that many young entrepreneurs may have on their hands. But Raynor says the three rules still apply to younger, smaller companies, if with a modicum of compassion in the application. Consider the rules "a compass, rather than a map," says Raynor. "You are lost in the forest and somebody says civilization is North. If I hand you a compass, I have done you a favor. You still have to be creative. You can't just walk straight north, you will bump into a tree, walk off a cliff, do whatever it is you do. And so sometimes you have got to go East, West, double back South even and really pay attention to cost for a while, but you want to make sure that over time, you are pushing your company in one direction versus another." Very often, new startups are especially cash strapped. And Raynor recognizes that. But the rules of putting quality and revenue first still apply on a comparative level. "If you want to have higher profits than your competitors, the way to do that systematically is not to have lower costs than your competitors," he says. Raynor cautions that this doesn't mean businesses should put "gold-plated Aeron chairs and Godiva chocolates in all the conference rooms," but that businesses should figure out where they are better than their competition and exploit that gap with higher prices or higher volume, not lower costs. "It is all about your relative position. If you want to be relatively more profitable, you want to have relatively higher volume and/or relatively higher price" than your "relevant" competition, he says.